This larger size makes it ideal for storing all of your garden items in one place. This larger 8x6 Apex Pressure Treated Shed has a traditional apex roof design, further enhanced by the smooth planed finial and barge boards. This larger size makes it ideal for storing all of your garden items in one place. 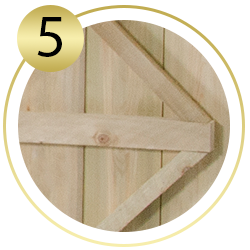 The sturdy shed door is braced with double "Z" framing and can be hung on either side. 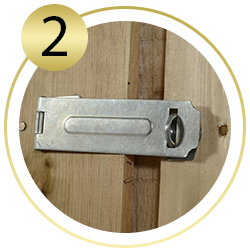 The door also has safe and secure hidden hinges and can be secured by the plate hasp and staple latch all for added strength and security. 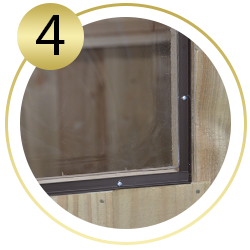 It has 2 windows to let in plenty of extra light which are made from unbreakable Polycarbonate that will never turn yellow or go brittle over time and are held in place with security screws. With all the timber pressure treated to eliminate the need for annual re-treatment and guaranteed against rot and fungal decay for 15 years the 8x6 Pressure Treated Overlap Shed is an excellent choice for your garden that will save you time and money in the future! This 8x6 Apex Pressure Treated Shed is manufactured from a square cut overlap timber construction which helps rain water run off the building and gives flexibility and movement. With a robust and stable pressure treated boarded floor and a weatherproof felted roof constructed from durable sheet material, for a long lasting shed which is FSC certified and sustainably sourced. Why choose a pressure treated shed? Buying a new shed is an investment in your home and garden. For just a little more than a dip treated shed, a pressure treated shed will offer added peace of mind and, in the long run, save you time and money. Our pressure treated sheds boast an impressive 15 year guarantee against rot and fungal decay. There is no need to re-treat the shed so, without the need for messy, expensive tubs of preservative and hours spent applying coats of paint, you can rest assured that your shed will be keeping its contents as dry and secure as when you first bought it. In addition to this premium treatment, our Forest branded sheds have a number of other great features to further enhance durability and security. 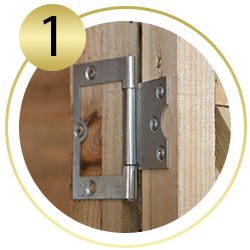 These design details include a hasp and staple ready for your padlock or a mortice lock with key; a boarded wooden floor – rather than OBS – for extra strength and stability; security door hinges; and so much more. 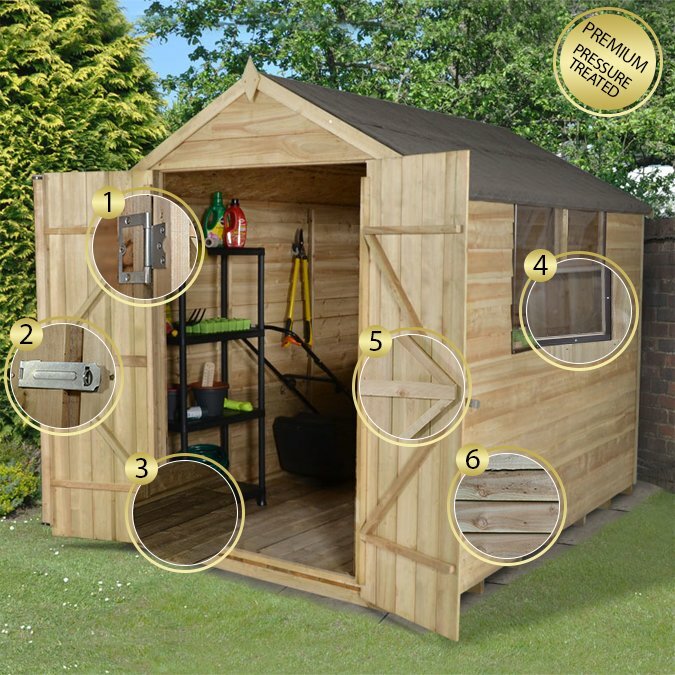 At Shedstore, we have a wide range of pressure treated sheds for you to explore. If you need any help, call us or use our online live chat to contact our friendly, UK-based customer service team. Pressure treated to impregnate preservative deep into the wood. Re-treatment never required. Saves an average £200 in treatments and precious time. Pre-treated with a waterbase treatment that only protects the product for up to 3 months against mould. 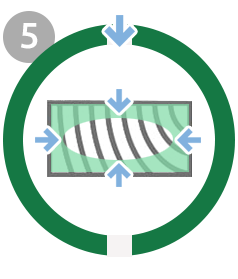 Recommended to treat upon installation and annually thereafter. Therefore, when comparing costs, add about 4 hours of your valuable time and at least £25 a year for every re-treatment. 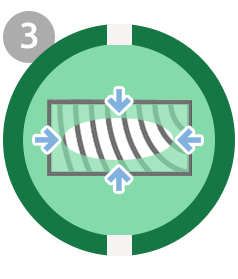 The Pressure Treatment process for timber has been applied to products for a number of years; the key benefit of this process is that the preservative is forced under vacuum pressure right deep into the heart of the wood and the grain structure. The preservative becomes an integral part of the wood; giving a long life and protection against rot. 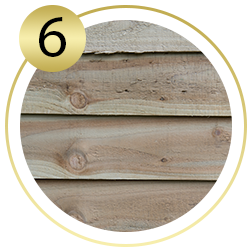 This process also means that you never have to apply preservatives to your garden shed, and it allows the natural colours of the timber to show through and so your shed blends easily within your garden. Surprisingly, our Pressure Treated Sheds are only slightly more expensive than our Dip Treated Sheds. 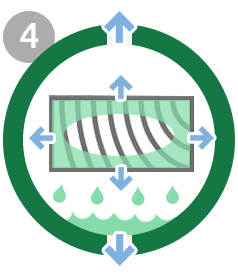 Timber is loaded into chamber and a vacuum empties timber cells of air. 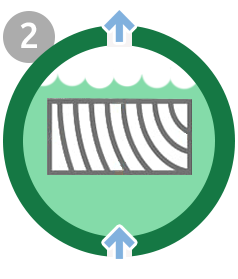 Cylinder is flooded under vacuum with preservative. 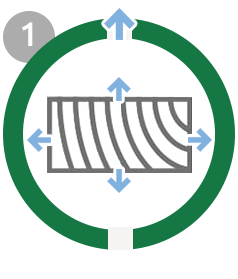 Preservative is forced deep into timber using hydraulic pressure. Another vacuum extracts excess preservative. 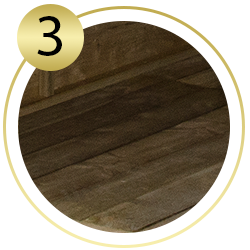 Timber draws in surface excess of preservative under low pressure, then is left to dry. NO NEED TO RE-TREAT - SAVING YOU TIME AND MONEY!